In a previous blog post we explained to you the origins and characteristics of the Oktoberfest in Munich. On the 6th of October this Munich Oktoberfest closed its doors after two weeks of enjoying German beer tradition. During these two weeks 6,4 million people visited the Oktoberfest area on the Theresienwiese in Munich and these visitors were very hungry and thirsty. In total they ate 114 ox and 58 calves. Furthermore they drank 6,7 million “Maß” (1-liter-glass) of beer. This is equivalent to 20,3 million bottles of St. ERHARD. That is an amazing amount. Unfortunately St. ERHARD was not available at the “Wiesn” in Munich. However our sponsoring of the Oktoberfest of the German embassy in New Delhi was a great success. While drinking a tasty St. ERHARD, our Founder and CEO Christian Klemenz could celebrate together with Gul Panag (former Miss India), the German ambassador in India Michael Steiner, Vikanshu (co-founder) and his brother Aayush, Aline (our management trainee), our business angel Günter Wiskot, a german live-band and a lot of other nice people. Check out the pictures on facebook! Now by the time the Oktoberfest in Munich is finished, in Franconia it is time for another traditional beer period: The “Bockbier” time! Bockbier is a stronger beer with at least 6,5% vol. of alcohol. Originally brewed with a high original wort for an extended shelf life, nowadays Bockbier is a delicacy for German and overseas beer fans. Every old brewery in the area of Bamberg has its own Bockbier as one of their flagship beers. Particularly in autumn and the beginning winter, Bockbier is very popular for warming the cold throats with its high alcohol concentration. 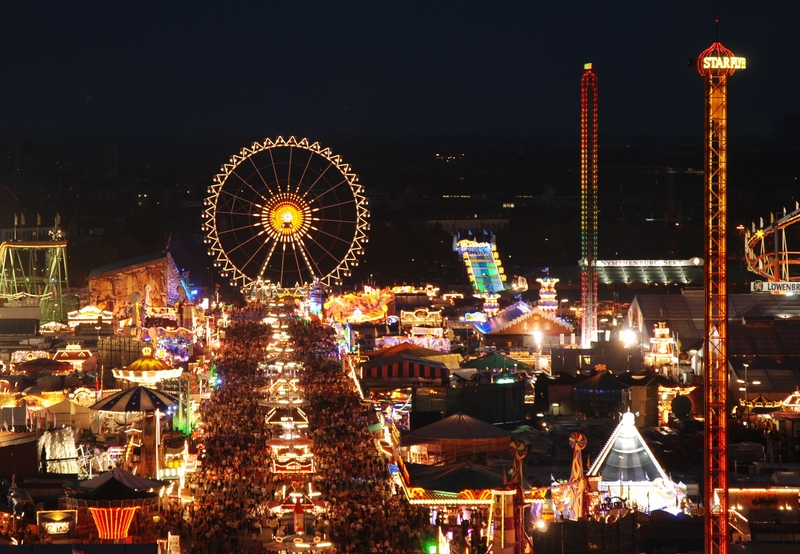 On Saturday the 21st of September the 180th Munich Oktoberfest began. It will last about two weeks until the 6th of October. The idea of the Oktoberfest dates back to 1810, when a Bavarian Lance Sergeant had the idea of celebrating the wedding of the Crown Prince Ludwig, later known as King Ludwig I, and Princess Therese of Saxe-Hildburghausen with a horse race. The very first Oktoberfest took place at the Theresienwiese (named after the princess) in Munich on October 17th 1810. The next year it was decided to celebrate the Oktoberfest again, comibing it with a presentation of the farmers’ achievements. In 1813 the Oktoberfest had to be cancelled fort he first time due to the Napoleonic Wars. In 1819 the city of Munich took over the administration oft he Oktoberfest or „Wiesn“ which then grew even faster, with new boothes and carrousels. Since 1850 the statue of the „Bavaria“, the warden of the Oktoberfest is located on the Theresienwiese. Even though it had to be cancelled due to wars multiple other times throughout its history, the Oktoberfest kept on growing and today it ist he world’s largest fair with about six million visitors each year. People of all nationalities come to visit the Oktoberfest every year who consumed around seven million liters of beer in 2010. Because it is so famous, many cities all over the world celebrate there own smaller version of the Oktoberfest every year. On October 3rd St. ERHARD will take part at the Oktoberfest of the German Embassy in Delhi, India, this year. – but they also lose a lot of curious things: a live rabbit, an eight-centimeter-grasshopper, a dog, a viking helmet, several wedding rings, a suitcase filled with music notes, and a pair of signed and framed sports pants. Lately after meeting people and sharing what I have been doing in Germany, I have realized that I have been living a German dream. Yes, it might sound funny but I think it’s true to some extent. What could be more German than working for a beer company and being enthusiastic about football? Being associated with St. ERHARD and exporting beer to Asia, my increasing enthusiasm about beer and brewing and also in soccer is taking me very near to know German culture better. I have always believed that India is one of the few countries which are blessed with strong tradition and culture but when I look around here in Germany I see how things like beer and soccer binds the whole nation. Few examples being at Oktoberfest and all other small regional fests where people get together, dress-up in their respective traditional dresses and drink beer portrays German culture more than anything else for me. The same goes with soccer. Being an Indian, I am a big supporter of cricket but after living in Germany for almost 2 years now I feel how a game like soccer gets so many people cheering in one breath under one roof. Fans travelling to other countries to see their team playing, spending a lot of money on buying team merchandizes and so on makes it an experience to live. It’s not just soccer but also other sports which play a great role in Germany. Kids are taught to play and excel in different sports activities and their parents encourage them to participate and learn them respectively. I personally experienced how it is to sit in a crowd of over 70,000 people with everyone screaming their teams name and encouraging them to play at their best at a soccer match played in Allianz Arena in Munich. I certainly got goosebumps that day. It was the same experience when I went to see a handball match which I never thought I would be interested in, but it totally changed my perception of how to see a game by seeing people sitting on their edge of their seats and screaming their lungs out. I feel privileged to be a part of such a culture and to live some years of my life in this country which is undoubtedly very rich both in values and traditions. Being a part of St. ERHARD plays a pivotal part in making my experience complete with a feeling that I am truly living a German dream.